Every local or foreign tourist should also experience in going to various Philippine Festivities. If you want to experience what it’s like to be in the Philippines, aside from the white sand beaches, lush forest and mountains, lakes and rivers, sumptuous foods and rich culture of the Philippines, why not have some fun and visit various festivals around the Philippines. A parade of the town’s loveliest ladies depicting the search and discovery of Christ’s Cross by Queen Helena and Constantine. A regionwide float parade representing all municipalities along the gulf, converge in one place featuring decorated bancas and vintas of different designs for competition. A festival in a setting replete with history and heritage, cultural treasures and reminiscences, the Viva Vigan Festival of the Arts has become one of the biggest cultural events in the North. Scene stealers are the Calesa Parade, Santacruzan, Inabel Fashion Show, Ramada contest, concerts, traditional games and the 2nd Vigan heritage amazing race. Pista ng Produktong Pilipino Manufacturers & Exporters Association, Inc. (PPPMEAI) together with ATMACS/Events On Line in cooperation with SBMA, will be mounting the biggest summer event in Subic, Olongapo City. The event will be held at the Boardwalk Beach Resort. Following are the activities: summer beach party, all night music with guest celebrities and show bands. A colorful cultural festival of pagan origin. Derived from the dialect, “alinsangan”, a word that describes the characteristics of the people living in the early settlements. It is a festival showing fertility and thanksgiving. The Pilipinyahan Fest is conceptualized by Tagaytay tourism council in coordination with the Local Government unit to promote the pineapple as the most appealing agricultural product in the locality. Parade of beauties from Tourism Oriented and related Establishments of the city. Pattaraday which means unity is an Ybanag word, it is celebrated on the occasion of the founding anniversary of Santiago. It celebrates the unity of the ethno-linguistic groups that have merged in the city to make it the melting pot of culture of Region 02 and contributed to the city’s progress and development-unity in action. Highlighted with the presentation of the Comedia – a moro-moro dance made famous by the Spaniards to stress the power of Christian Religion over the Moorish non-believers; other activities include beauty pageant, grand batalla presentations and a grand street dancing parade and exhibition with performers from other cities, provinces and regions. A 10-day fiesta commemorating the town’s rich ancestry and devotion to the San Vicente Ferrer – its town saint and the Calapenhons “pahinungod” (offer) to come home annually. It is a month-long fiesta celebration of Butuan City. Several activities are lined up for the celebration like Mutya Hong Butuan Pageant, Sports Fest and Santacruzan. A festive celebration of meeting the Holy Cross of Bauan and the Holy Cross of Alitagtag at Binukalan Shrine at 8:00 am. The celebration is highlighted by a program and praises for the Holy Cross accompanied by street dancing and finally at 2:00 p.m., the Holy Cross of Bauan returns to the Parish Church of Bauan where the jubilation culminates. Dayaw is an old Tigaonon term which means “to show off, parade or display”. In its strictest meaning, dayaw is to present with pride what is distinctly and essentially inherent in a person. Dalan on the other hand, means in olden times, a mountain trail which now includes path, street and highway. Dayaw Dalan Festival symbolizes the best of what the municipality of San Jacinto have as a town and as a people. The festival is held in honor of its patron saint, Santo Cristo de Burgos. Established since 1973 and considered as one of Iloilo’s oldest festival, visitors are treated with an extensive showcase of 18 gaily-decorated carrozas with painted carabaos and their muses clad in their best Filipiniana attire. Another attraction in the festival is the 110-meter lane racetrack for the Carabao-Carroza Race. Annual festival to promote the major product of the town, garlic or “bawang”. Festivity includes street dancing competition in garlic-inspired costume, selection of Miss Garlic Festival, biggest garlic contest and longest most creative twined garlic. Anniversary of the establishment of the civil government of Isabela in honor of Queen Isabela II. Activities like agro-industrial trade and tourism fairs, parades, sports events, beauty pageant and others are conducted to entertain visitors. A showcase of the city’s historical heritage and identity promoting the city as industrial and tourist hub, that involves the Spanish regime through street dancing, dioramas, floats, heroes and great personages as higantes, food festival and sports events. Objective of the event is to promote “basi”, a wine made from sugarcane. Activities include street dancing, Search for Ms. Naguilian, agri-trade fair, farm tour & amusement games. One of the biggest processions in Metro Manila participated in by young ladies representing the 33 barangays of Makati, tourism-related establishments, local and government offices corporations based in Makati. A grand reunion for all Butuanons residing abroad and other parts of the country to come home and reunite with old friends, classmates, and relatives especially during the Balangay Festival and Adlaw Hong Butuan. Promotes the juicy and sweetest pineapple or “pinya” as main agricultural product of the town of Calauan. One of the country’s biggest, and most colorful harvest festival every May 15th, along with the harvest festivals of the towns of Tayabas, Sariaya, Gumaca and Tiaong. These are the Philippines best known harvest festivals to honor San Isidro Labrador, the patron saint of farmers. Known as the “Pahiyas”, the festival is deeply rooted in the traditional celebration of the townsfolk in thanksgiving for bounty harvest. Decorations called “Kiping”, leaf-shaped and multi-colored rice paste wafers which are used to decorate the facades of the homes along with fruits and flowers from nature. The visual and culinary feast has gained national and international recognition. The Lucban town center is a permanent facility for merchandising crafts and delicacies including special events that showcases the lifestyle of its environs. Huge arches placed on the strategic locations are lavishly decorated with the most colorful farm produce, local delicacies, horticultural products, palm fronds etc. It is an agro-industrial show that featured species of plants and flowers in a display of unique landscapes. Sunduan is the Filipino term for “fetching”. This celebration features a parade of escorted young ladies holding colorful parasols. Brass bands fetch each pair and parade around the town. Street dancing and procession along the city’s major thoroughfares in commemoration of the feast of San Roque, highlighting the customs and traditional celebration of the festival. Hundreds of work animals, mostly carabaos, are led on a parade in the streets of the town every 14th and 15th of May to honor its patron saint, San Isidro Labrador. The carabaos decorated with garland and shaved for the occasion, genuflect or kneel in front of the church. 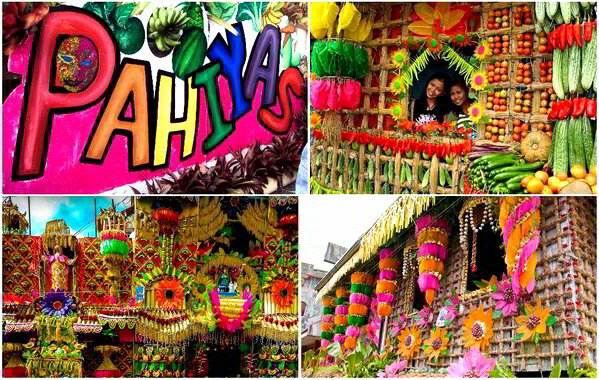 Witness the colorful Carabao Festival and religious activities of the town. The celebration is manifested by hanging all sorts of fruits, candies, food crops and multi-colored kipings on bamboo poles. The affair is highlighted by kneeling of carabaos in front of the church and the symbolic floats. Bringing the best of the Bicol region showcasing its products, festivals, arts and crafts, among others highlighted by the procession of Our Lady of Peñafrancia joined by the Bicol Association of Cebu and Marianne devotees. Farmers pay tribute to their patron saint, San Isidro Labrador with a colorful and joyous procession of carabao carts carrying a myriad of local products. Prizes are awarded to the strongest and most beautifully decorated carabao. Likewise, a carabao paper mache contest is being held and included in the parade. An annual celebration in honor of farmer’s patron saint San Isidro Labrador. Celebrated with much gaiety and funfare. It features agro-Industrial fair, beauty contest, sports festival and street dancing depicting movement of monkeys. Witness the songs and dances of the tribe, their way of life, indigenous games, especially how the community is taking care of the environment. Couples who are childless, maidens and bachelors can take this occasion to appeal for heavenly intercession and dance to please the Virgin of Salambao, San Pascual de Bailon and Sta. Clara. Farmers also thank the Virgin for bountiful harvests. A fun-filled summer activity to immortalize the song Sarung Banggi and pay tribute to its composer Potenciano Gregorio. It showcases a variety of cultural and religious activities, food and sports fest, Beauty Search, folksong fest, agro-industrial fair and many more. A dance of the drinkers honoring the age-old process of wine-making. A festival that highlights a street dance parade participated in by cressed up framers; agro-industrial trade fair; contest of the biggest farm harvest and livestock, “Pinaka” contests agro products. A cultural dance festival of the city featuring coconut as one of its major agricultural products. Anniversary of the establishment of the civil government of Nueva Vizcaya. Activities include street parades,street dancing, cultural shows, float parades and contest, sports events by municipality, agro-industrial fairs, others. A music and dance festivity depicting the history, folklore and traditions of the Lobocanons. Bolibong Kingking is a term applied to the drums and gongs and their rhythm used to accompany the supplicantion dance ritual in frong of the Image of Our Lady of Guadalupe, the 2nd Patron of Loboc. A grand parade and street dancing of people in scarecrow costumes to celebrate a good harvest. A trek to Mt. Manurigao-Malumagpak, one of the region”s newly discovered eco-tourism destinations. Department of Tourism together with Intramuros Administration will bring back the glamour of the 1900s Manila Carnival Queen in this year’s Santacruzan sa Intramuros. A festival showcsing colorful costumes fashioned from the abaca fiber. It is highlighted by a grand street presentation wherein the participants are clad in colorful costumes using the abaca fibers. Tapusan honors the Holy Cross on the last day of May. Floral offerings are laid at the foot of the cross during the afternoon ceremonies in the town church. The observance peaks on the 31st of May with a colorful procession during which the cross is mounted on a gaily decorated float, together with other floats swathed with lights, silken fabrics and freshly cut blooms to honor the various Marian images. Parade of beauties with Reyna Elena carrying the Holy Cross. The event aims to revive the Hundred Islands not just as a beach destination but also an excellent venue for agri-tourism fairs (fish/oyster/vegetable/fruit exhibitions). Features singing contest, ballroom dancing, bar tending competition and acoustic nights. More fun and funky than Olympic in effort. Runners from all over the world join the 13-kilometer marathon. A $1000 prize awaits the first to cross the finish line. The celebration is derived from the ancient Spanish religious festival in honor of the Nuestra Señora de Turumba. Afternoon procession and street dancing is preceded by a Pagoda parade held in Baras River. Pasinggatan Festival comes from the word “singgat” meaning to shine or luster, an apt name for festival whose events bring out the best in people from their talents to their personalities. The municipality of Bauan celebrates the Sublian every May 2nd. This festival aims to revive the centuries-old tradition of dancing the Subli, an indigenous dance of Bauan. This dance ritual is being done to pay homage to the Holy Cross of Bauan. Fiesta of Sta. Cruz in honor of the Holy Cross. Religious, cultural and civic activities are lined up for the event. A festival that centerpieces the Balsa as a way of relaxation by the Matabungkay Beach Resort. The celebration is culminated by a race and decorating contest for the Balsa. The festival is spearheaded by the Matabungkay Beach Resort and Hotel and the private sector of Lian, Batangas. This is a thanksgiving celebration to the Lord for the good harvest and abundance of their agricultural production. The May 15 celebration in Sariaya mirrors the townfolks generosity in spirit, their faith in the Divine Providence and their ingenuity in craft production and culinary traditions. The celebration of the Sariaya folks during feast of San Isidro Labrador makes it unique from other May 15 celebrations in the Province. A thanksgiving event marked with agro-trade fair and the famous Agawan ng Suman in honor of San Isidro Labrador, patron saint of farmers, for the good harvest and abundance of agricultural produce. An annual event showcasing Puerto Galera’s rich historical heritage, culture and abundant natural resources. The highlight of the event is a fluvial parade at the sea joined by devotees of Our Lady of Fatima. The wooden boats are elaborately decorated in a tropical setting. Huge arches placed on strategic locations are lavishly decorated with the most colorful farm produce, local delicacies, horticultural products and palm fronds which are offerings of the local townsfolk to San Isidro, patron saint of farmers, for their bountiful harvest, good fortune and prosperity. The decors are mounted on frames that are playfully lowered and raised to the delight of guests, children and local townsfolk who joyfully reach out and compete with each other to share the goodies. Panalaminan is a Cuyunan word which means “to mirror”. The festival’s name refers to both the municipality’s history as a repository of silica sand used in producing mirrors and glassware and to its’ claim of being the reflection of Northern Palawan beauty, with Roxas as a point of the bountiful convergence of Agri-Fishery and Ecotourism. A seven-day cultural extravaganza that features the town’s colorful history, amiable people, tasty cuisine and its locally fermented wine which can only be found in Mauban. A festival highlighting the Higanteng Alimango as their icon. The feast celebrates the abundance of mud crab in the province. A parade of floats with different motifs, the best of which is given an award; a Mardi Gras is likewise presented while people eat, drink and dance on the streets. An annual event which started in 1999. The festival aims to promote pineapple and other agricultural products of Calauan. It features cultural presentation and exhibit performances, mardi gras, street dancing, pineapple float parade, pineapple and native products décor contest. Conceived to recognize the value of sugar industry in 6 municipalities of Western Batangas (1st District) at the same time to honor the hardwork of sugar cane farmers and promote their livelihood. The festival aims to strengthen and promote the rich history and culture of the province of Cavite. It is a celebration commemorating the bravery and patriotism of the revolutionaries who won in the Battle of Alapan in Imus, Cavite a hundred and twelve years ago. The event derived its title “Wagayway” from the fact that the first Philippine flag which was sewn by Marcela Agoncillo in Hongkong was furled on May 28, 1898 in Imus following a victory by local revolutionaries against the Spanish forces. A grand procession of celebrities, models and beauty queens wearing the creation of some of the top fashion designers of the city. It is an offshoot of the traditional Santacruzan/Flores de Mayo, which is an offering of flowers to the Blessed Mary for the bounties received. A streetdancing and procession along the city’s major thoroughfares in commemoration of the Feast of San Roque highlighting the customs and traditional celebration of the festival. Highlights the services being provided by the local government & non-gov’t. organizations by showcasing the city’s rich cultural traditions. A competition based on the physical beauty, personality and talent open only to resident women of Malabon City. Mary, the Mother of Christ, is the Patroness of the City of Mandaluyong. The city folks pay tribute to her by way of a procession called Flores de Mayo, a culmination of a month-long floral ceremony that displays lovely maidens of the city in fabulous gowns and under arches of summer blooms. Today, the festival has become a fashion event where movie stars and beauty queens act as “Sagalas”. TIKANLU is an acronym of tinubong, kankanin, lubilubi, in celebration of their native and One Town One Product that coincides with their patronal fiesta. Activities include street dancing, trade fair, balikbayan night, singing & beauty contests. It is celebrated as part of the town fiesta. Featuring 101 families eating Dinengdeng, trade fair, fluvial parade, beauty contest, street dancing, Mayflower Festival, Amazing Race, Kite Festival, bloodletting, Pabingo and concerts. This is what the Sarratenos call their fiesta which stands for liberty, courage, leadership, unity & brotherhood even in the most certain pain of death. Commemorates the ancient peace pact that has brought lasting peace between and among ethnic tribes that brought forth rich culture, customs, indigenous traditions and fellowship with stronger ties not only among themselves but also with the Ilokanos who intermingled with them. Celebrated with street parades, boat rowing competition, beauty pageant and OFW night, among others. The extensive use of ‘labig’ the leaf of a palm tree called ‘palma brava’, which is grown abundantly in Claveria, for costumes is encouraged. An event to coincide with the town fiesta of the municipality aggressively promoting the one-product-one-barangay scheme in their agri-industrial trade fair. Hon. Carlito F. Pentecostes, Jr.
‘Aramang’ is an exotic and palatable soft-shelled shrimp harvested sustainably in Aparri year round; export quality dried ‘aramang’ is marketed in Japan, Taiwan and other parts of the country. The event also features a fluvial parade of more than a hundred fishing boats showcasing the fishermen’s way of life. The town fiesta highlights the production of Sarakat products made of sarakat leaves grown locally to produce hats, mats, bags in an agro-industrial trade fair with street dancing and other events. Fiesta celebration highlighting the agricultural product of Lasam, the Aringay Rice variety with agri-industrial trade fair, street dancing and other activities. The town celebrates the use of ‘Gakit’ , Gaddang word for raft, by the tribes of Angadanan as their mode of transport; Gakit is used to transport passengers and goods from one town to another through the mighty Cagayan River. Anniversary celebration of the establishment of the civil government of Nueva Vizcaya highlighted by an agro-industrial trade fair, street parades, float competition, cultural presentations by indigenous groups participated by the 15 towns of the province and others activities. Festivities features the typical celebration of the town fiesta with baratillos, parade, playground demonstration and people’s night. Celebrated every May 1st to honour the miraculous patron saint of Gapan City, Nuestra Sra Dela Virgen Divina Pastora. This colorful, vibrant festival spiritually strengthens the faith and devotion to Virgen Divina Pastora. The name Marilao originated from a plant (shrub) that abundantly thrived in swampy areas during Spanish era. The matured plant bears light yellow flower & the edible roots are colored dark yellow (dilaw). The yellow roots became famous and used for various purposes now we called “luya”. The purpose of the festival aims to inculcate to the residents & the youth, the love and appreciation of the origin of the town. A festival highlighting Domarokdok, the native dance of Botolanenos. Activities include streetdancing , sports competition and search for Mutya ng Botolan. It also celebrates the feast day of their patron Saint, Sta.Monica. The entire province of Pampanga remembers the patriotism of one of the City of San Fernando’s illustrious sons, Chief Justice Jose B. Abad Santos, who was martyred by firing squad in Malabang, Lanao on May 7, 1942 by the Japanese for his refusal to pay allegiance to the Japanese flag. He is remembered for his famous words, “It is a rare opportunity to die for one’s country. Not every Filipino is given this chance”. The Araquio Festival is a traditional procession and dramatization of the finding of the Holy Cross by St. Helena and her son, the Emperor Constantine. Similarly the “komedya” or “moro-moro” is carried out on in some villages such as Poblacion (2nd Sunday of May), Las Pinas (May11-12), Sto. Tomas (1st Sunday of May), San Jose (3rd Sunday of May) and Pinasahan (May 21-22). Dating back from the Spanish colonial period, the festival features vivacious beats of brass. A culminating procession participated in by local townfolks children and adults from different barangays elegantly dressed following the traditional practice of Santa Cruzan. A one-week affair which celebrate the founding anniversary of the Province of Tarlac, coincide with the National Flag Day which is May 28. The celebration starts with the flag raising ceremonies, celebration of mass, then followed by the opening of the agri-trade fair, and other activities like Palaro ng Lahi, Pistang Bulilit, Senior Citizens’ Night, Pageant Night, variety show, battle of the bands and fireworks display. The procession in honor of the Holy Christ is held in practically all towns and cities in the whole province. Every parish celebrates the ending of the Flores de Mayo during the last week. Held during the feast of its patron saint, St. Michael the Archangel. It is a salute to and a celebration of life – its richness and abundance of blessings as Caramoan is endowed with untapped natural resources and many beautiful unexplored islands as well as its white sugary sand beaches that lure foreign and local tourists and investors. Highlighted by a street dancing and agro-industrial fair which expresses local folk’s gratitude for their town’s name etymology and signifies the abundant presence of rooster available in the locality. Held also in celebration of their Black Nazarene’s Feast Day on May 13. A weeklong festivity coinciding with the feast of Our Lady of Peñafrancia. The festival name was taken from a local word “layag” or sail boat which is a primitive means of transportation of the early people of Rapu-Rapu. It depicts the people’s journey of faith. The festival features local talents and young artists in its efforts to promote cultural awareness, tourism development and youth empowerment in the District of Partido. Highlighted by the Bicol Love Song Cultural Competition, other activities are also lined up to drumbeat the affair. As the largest producer of coconut and bangus in Cebu, Pinamungajan celebrates their bountiful harvest in the Pamuhuan Festival. It is also a time to celebrate the fame brought to the town by its sons and daughters. Kagasangan comes from the Cebuano word of the same name which means “corals”. It is the highlight of the town’s annual town fiesta and celebrates the town’s main tourist attraction – its corals. Moalboal, the diving capital of the Philippines, takes prides as having one of the most bountiful and breathtaking coral formations thus giving the town an abundance of fish catch. A celebration of harvest of its major agricultural product, bananas. The festival depicts the growing cycle of this famous fruit from planting to harvesting in dance form. Lapyahan Festival celebrates one of San Remigio’s treasures, its beaches. Having the longest shoreline in Cebu Province, San Remigio is a primary destination of both local and foreign tourists alike because of its powdery white sand beaches. This festival celebrates the main source of food and livelihood in Maria, Siquijor, the “Lubi” or coconut. The festival is celebrated with a dance which commemorates the progressive succession of manual manipulation on the fruit of the coconut during harvest. A prelude to the annual town fiesta, some of the highlights are trade fairs and market bazaars, which are located at the town center. The Festival celebrates the city’s historical treasure that was lost to the sea hundreds of years ago. A street “Mardi Gras” commemorates their lost treasure while thanking the town’s patron saint for the year’s bountiful harvest. Street bazaars, agri-fairs, beauty pageants, town concerts and fireworks competition are also part of the town’s festivities. Sinugboan is a term closely related to the Cebuano word ‘sugbo’ meaning to wallow. The festival highlights the town’s annual commemoration of her foundation day. Activities include agro-industrial fair, recognition program for achievers, various games and a street dancing competition where the storyline focuses on the creation and establishment of Garcia-Hernandez. The town of Liloan has always been associated with one of Cebu’s primary delicacies – the Rosquillos. The festival traces the product’s history – from its humble beginnings in 1907 until it was named “rosquillos” (after the Spanish word, rosca) by Pres. Sergio Osmeña to what it is today. Search for the Cross by the Saintly Queen Helena. Parade of sagalas and parol (lanterns). An inter-barangay competition in Tacloban is also practiced. A week-long celebration featuring agro-industrial fair, sports, concerts and cultural shows. This is a concoction of the different festivals of the 25 municipalities and two cities of Zamboanga del Norte where festival champs of each town and city converge in a single jubilation. It is also celebrated as Linggo ng Zamboanga del Norte. A local competition of buntings with the use of indigenous and recycled materials as the main element of the various artistic creations. Cultural and sports activities and Fun Games . Kite flying competition features the most colorful, most artistic, the biggest kite and smallest kite. Honoring of National Flag. Activities include a commemorative program at the Rizal park, display of the evolution of the flag and ceremonial retiring of old and tattered flags. Celebration for the feast of St. Joseph the worker. A religious activity celebrated every First Sunday of May. Celebration of sportsmanship and camaraderie, through simultaneous tournaments of different sports events. Celebration of the Feast of San Isidro Labrador. Dapugan is a common kagan and mansaka word which means gathering. The gathering celebrates the abundance of coastal resources of Mabini. A cultural celebration that revives the Roman Catholic traditions of fiesta introduced during Spanish era in the Month of May. Sagawak is a great volume and forceful flow of water that the Lumads believe to cast away the evil spells. The spells are buried at the bottom of the deepest sea and eventually brings harmony, unity and progress amongst the people. This is an annual festival which entails the rich culture, unique customs and worthy traditions of the Tagacaolos of Malalag. A month-long beach sports activities that advocate the conservation of marine resources being a protected seascape/landscape in Comval. It features water and land based sports, music and dance during the night. Celebrated in honor of St. Joseph, the worker, featuring trade fair, beauty pageant, street dancing and sports competition. The festival pays tribute to the importance of the Bay which for years has sustained life because of its rich marine resources. The festival is also a venue to inculcate to all stakeholders the importance of protecting and conserving the bay through eco-tourism. “Binuyugan” comes from the Ilocano word “buyog” which could be understood as “accompanied by or coupled with.” This is clearly presented through street dancing competition which presents a diverse interpretation depending on the cultural background of participating barangay. Agro Trade Fair is another principal attraction held inside the Maitum Forest Park showcasing local products. Highlights include bancarera, ballgames, Masbol Festival, Band competition, religious & cultural nights & horse fight. An annual cultural celebration which aims to enrich the culture of Natonin. It showcases the traditional as well as modern games of the people of this municipality. The 2nd municipality of Abra Province to implement programs and activities which are truly reflective to teh preservation of the culture and the arts, practices, traditions, socio-economic and livelihood activities of Dolorenians. Hon. Robert Victor “JR” Seares, Jr.
‘Kuyayang’ is a courtship dance of the Bogohanons that is staged before the community during fiestas. This street mardi gras as a cultural tourism festival of Bogo manifests the cultural heritage of the town and serves as an avenue for cultural conservancy of the city. Barangay Bel-Air’s annual thanksgiving celebration encourages everybody in the community to join in fun activities that culminate in specially choreographed dance numbers of more than 200 villagers. Patterned after Lange Nacht der Museen or Long Night of the Museums in Berlin, Germany, museums and other cultural establishments in the city remain open late into the night on the last Friday of May. The event serves as an opportunity for Butuanons residing abroad and other parts of the country to re-unite with friends and relatives and see for themselves what they can share in the development and progress of Butuan. An annual festival conceived as thanksgiving to their patron saint, Our Lady of Peace and Good Voyage for a bountiful life. It is the showcase of the meeting of the community and the artist, a festival that looks to the product of this interaction and impresses the equal importance of community participation in the artistic process, with the main goal of conserving the environment. Our Lady of Lourdes College Found.